The area around Alicante is said to have been inhabited for over 7000 years. In more recent times it’s become a major tourist destination with serious development in the 1950s and 1960s resulting in large buildings and complexes springing up throughout the city. 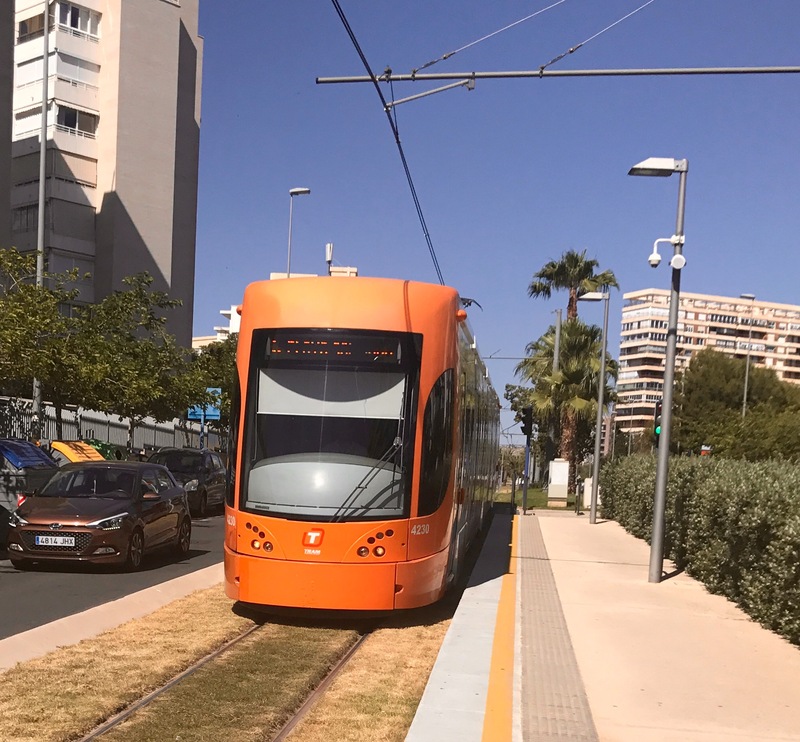 This means Alicante is the perfect example of a concrete jungle. High rises dominate the skyline (and not in a particularly attractive way) and on first sight it doesn’t seem like the prettiest of holiday destinations. It would be easy to dismiss the city as place not to visit in Spain. But you’d be wrong. 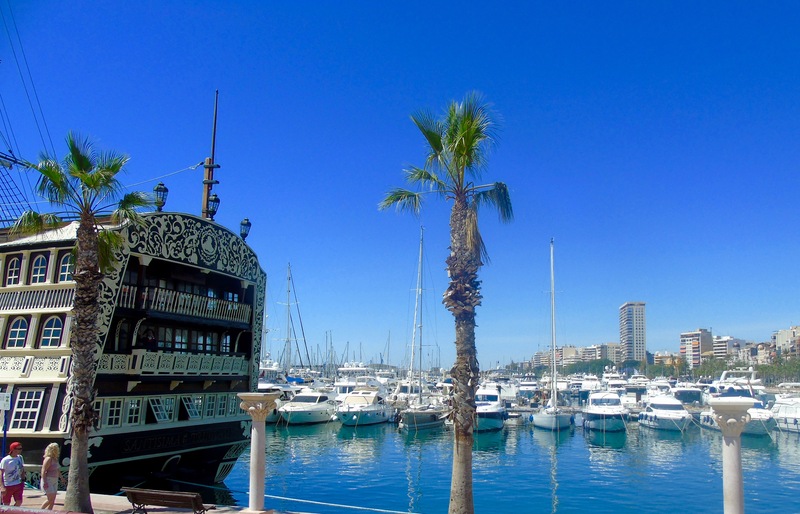 Well, they do say you should never judge a book by its cover and as soon as you start looking a little deeper into the soul of Alicante you’ll be surprised to find many beauties. While those buildings can’t be unbuilt, a lot of effort has been made to add beauty with the myriad flowers and trees. Jacarandas, bougainvilleas and hibiscus abound (gotta love those exotic names) and there are palm trees everywhere. 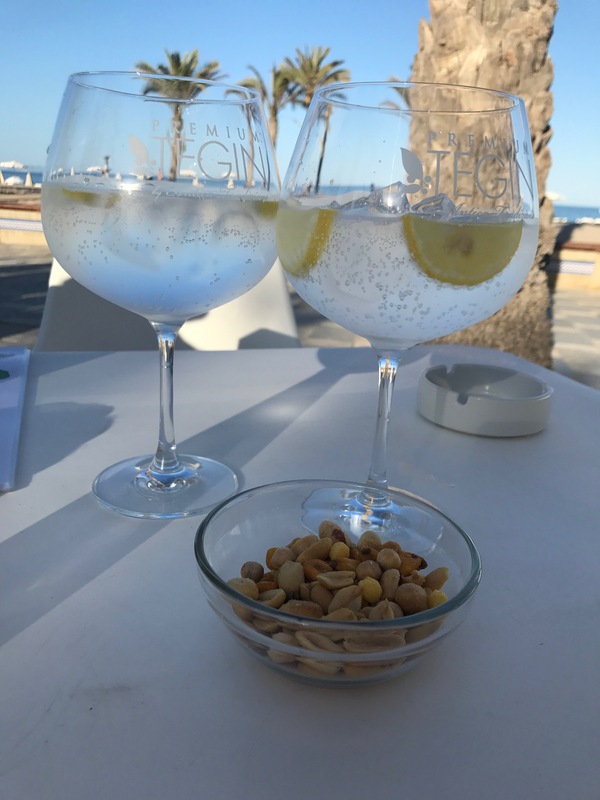 Of course, as you’re in Spain, the sky is always blue – different colours of blue for different times of day – the sea is warm and clear, the food is wonderful and there’s a warm Spanish welcome. 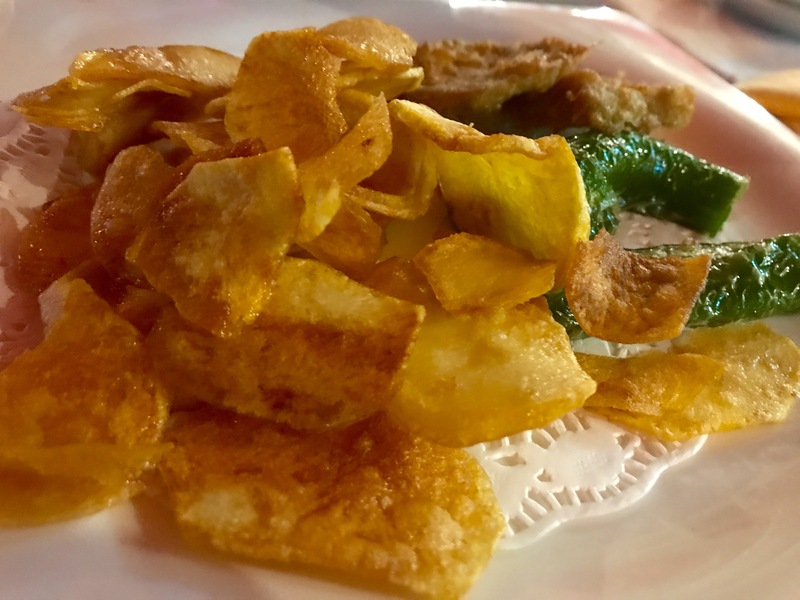 Because this is a truly Spanish city where simple food is perfectly prepared using the best of local ingredients, prices are great value and you’ll need a bit of Spanish to get by. We stayed in the San Juan Beach area. 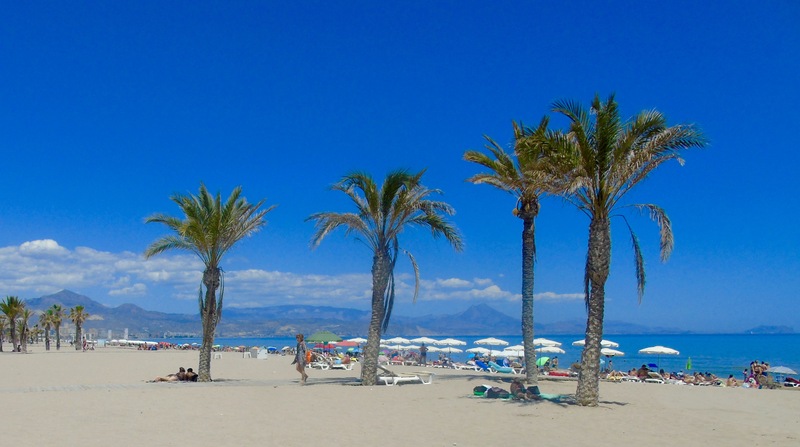 And my first realisation that Alicante wasn’t what it initially seemed was the sight of the stunning beach. I mean really stunning. Huge, with white sand and mountains in the background. 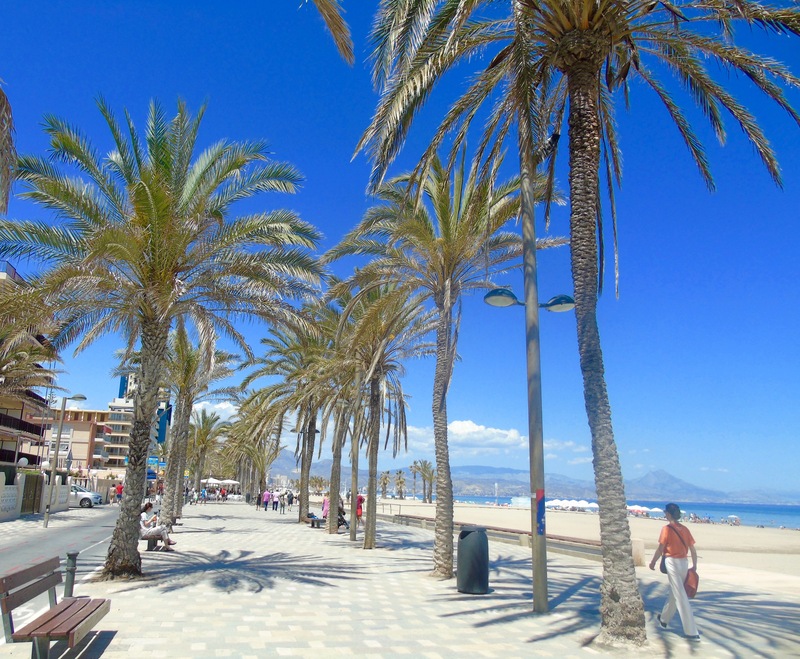 And that fabulous Spanish tradition alongside it – the promenade. Lined with restaurants and bars, the beautifully paved area in the shade of palm trees was busy all times of day with families and friends enjoying their daily amble. There are so many restaurants along this stretch of sandy sunniness that it’s hard to choose where to eat. As luck would have it we picked the perfect breakfast spot on our first morning. One of my favourite breakfast treats ever is pan con tomato, lightly toasted bread served with what is basically mashed up tomato and olive oil. It’s amazing how good it tastes. Today’s offering also came with a generous portion of jamon – so that’s even better. And here’s the best thing of all – this delicious breakfast, including a glass of fresh orange juice and a coffee set us back the sum of €1.80 each. No that is not a typo. 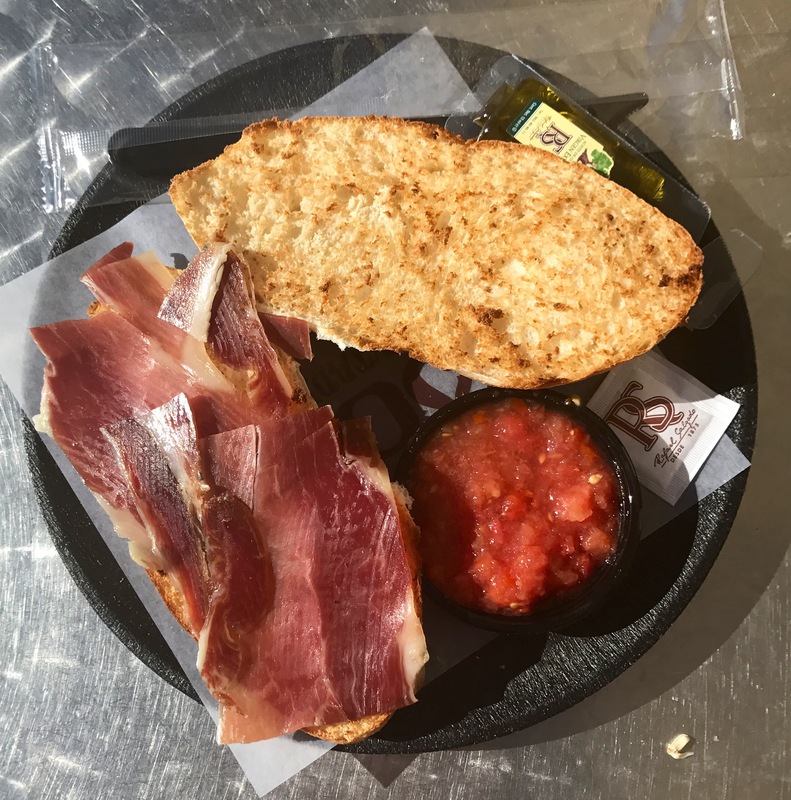 €3.60 for two filling and deliciously Spanish breakfasts at 100 Montaditos right on the beach. Seriously, does life get better than that? Breakfast certainly doesn’t. Lunch along the promenade also offered a range of traditional Spanish tapas dishes. Like this Russian salad (ensalada Russa) which crops up on menus everywhere I go in Spain. You can read more about this dish and try out my recipe for it by clicking here. I’ve sampled some different versions recently so think I will be redoing my own recipe soon. Playa San Juan is also the perfect place for sundowners. Especially if you’re a fan of giant gin and tonics like these. We meandered the streets absorbing the evening sun and the pleasant babble of Spanish voices, checking out menus while we decided where to go for dinner. One of my favourite ways of spending time! Our choice was Los Charros, a charming-looking establishment on a side street up from the beach. And what a good choice it turned out to be. 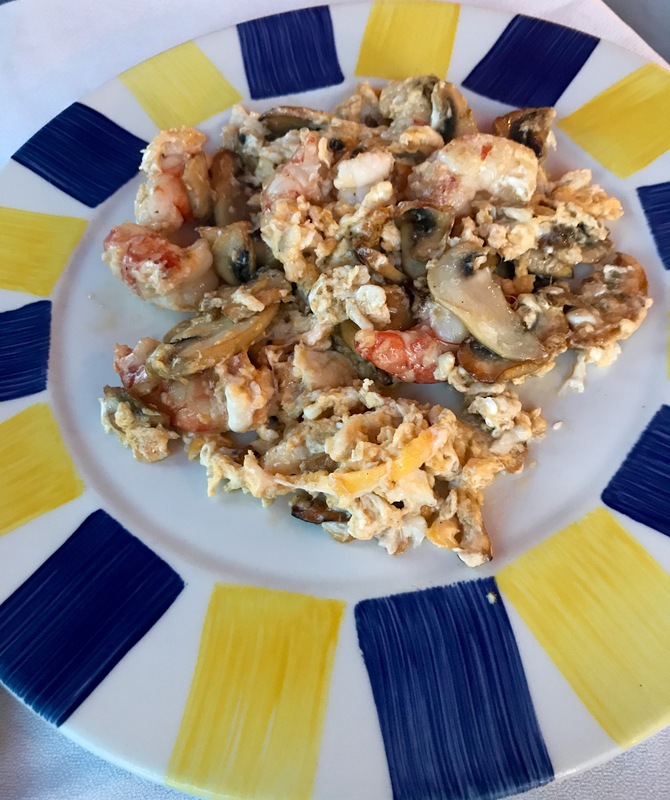 We started off by sharing this delicious concoction of eggs, prawns and mushrooms with a touch of garlic. 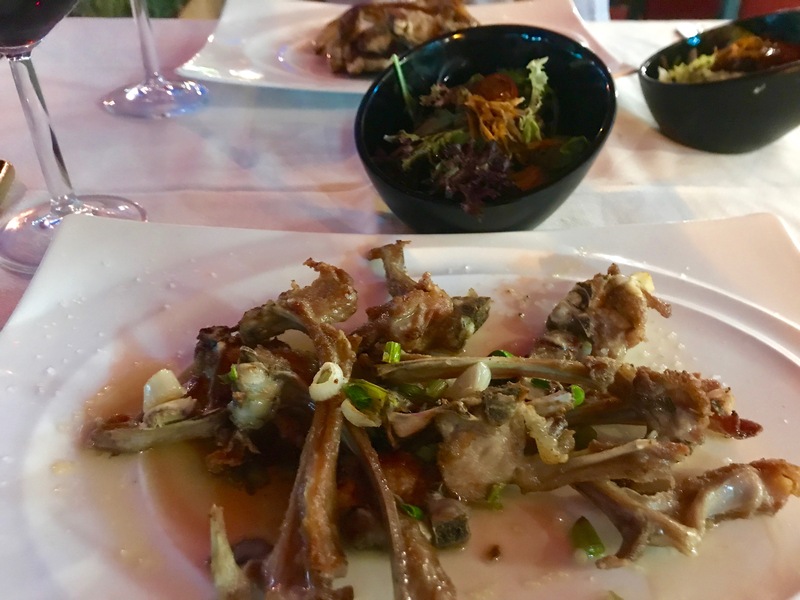 For mains we decided on lamb and goat chops respectively – simply served grilled with some lovely wild garlic and more accompaniments than we expected, including a salad, crispy fired potatoes and padron peppers and a large dish of tempura-style vegetables. All served with a smile. We sat outside on the lovely terrace – something we always do when we can. I think it comes from living in the Northern hemisphere. Dining alfresco is always a treat. 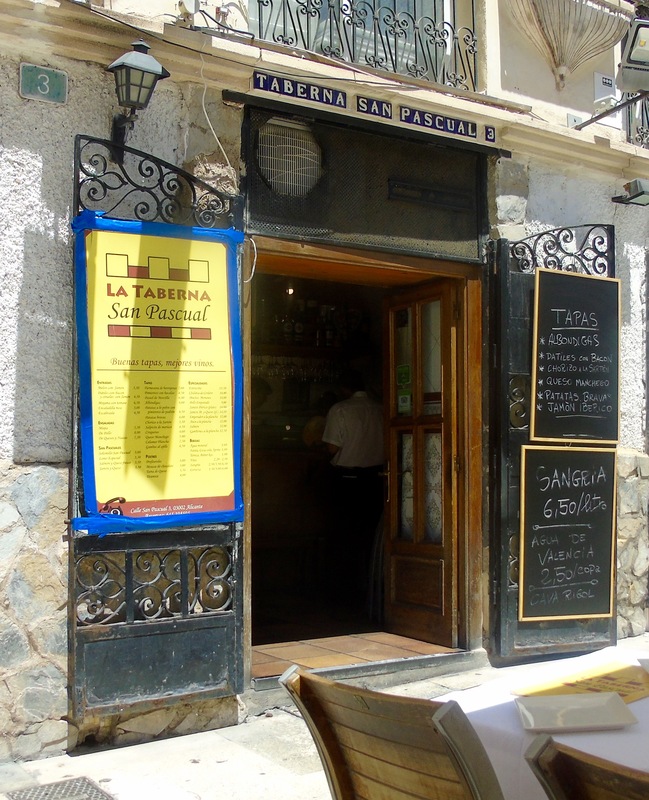 The tapas bar inside was bustling with locals and filled with laughter. On our second night in Alicante we were highly tempted to go back to Los Charros. 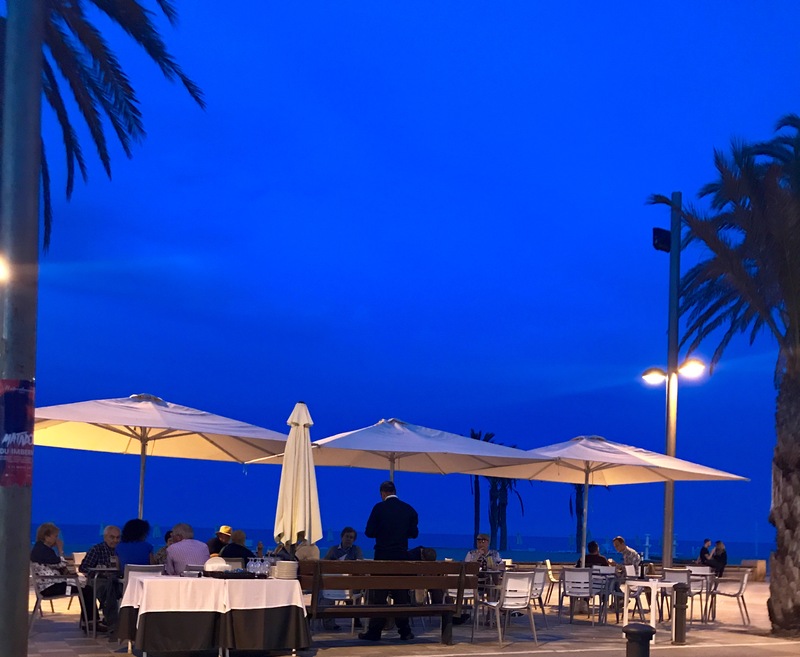 But as we were only there for two nights it seemed boring so instead we chose El Mayoral for dinner, which is on the San Juan promenade. The menu was extensive and we were having decision-making hiccups. Until we saw what the couple on the next table were tucking into, a delicious seafood soup. 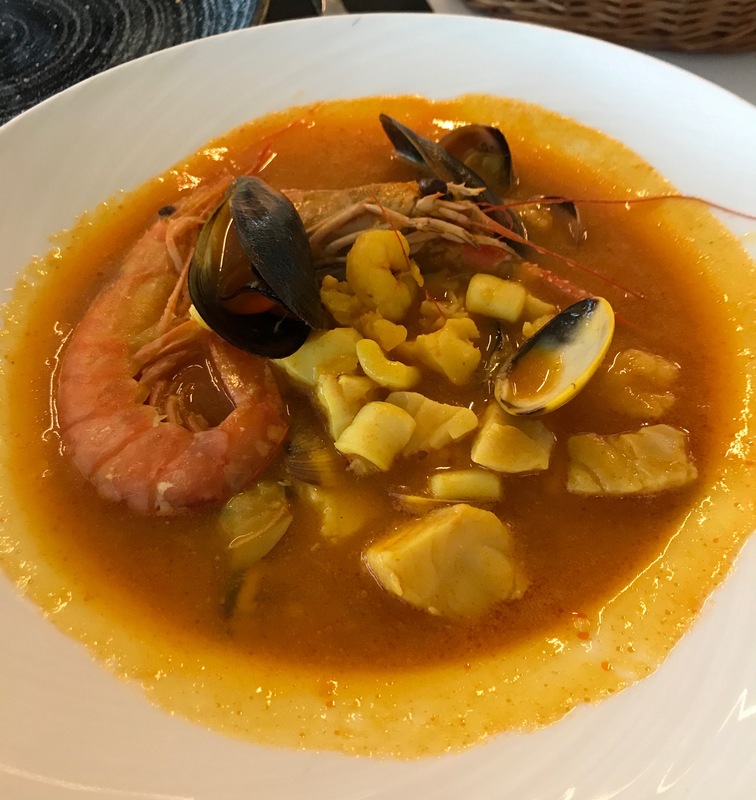 So we ordered the same – langoustines, prawns, mussels, the softest of calamari and fresh hake in a lovely saffron-flavoured broth. 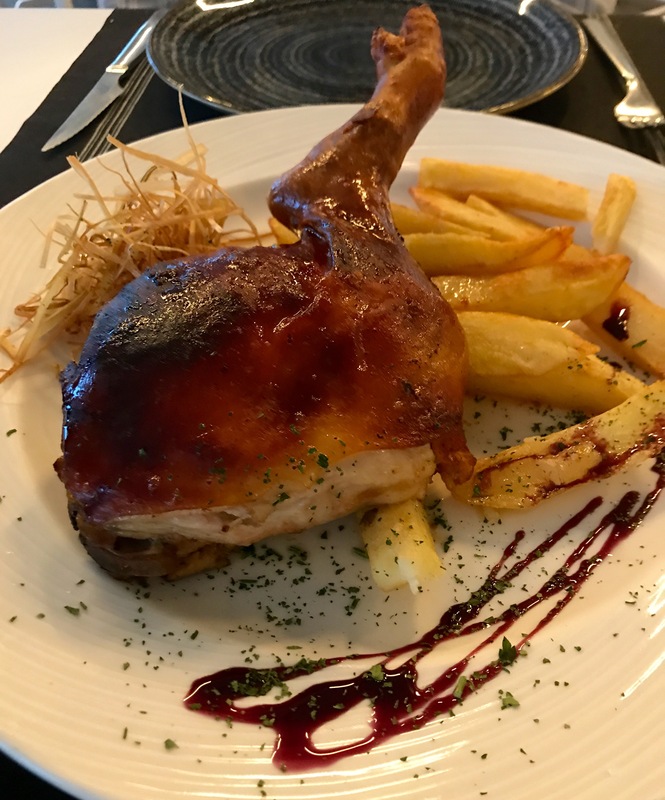 A Spanish classic for mains – roast suckling pig served with perfect chips and slivers of crispy fried onions. 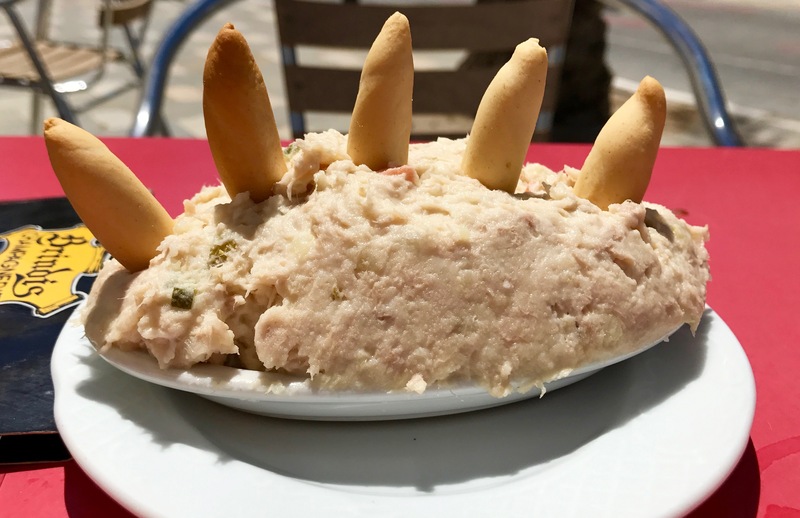 Love the suckling pig in Spain, they know their pork! We finished our wine after dinner alongside the beach watching the sky develop through stages of blue until it reached this stunning indigo colour with the last light of the day. As hard as it was to drag ourselves away from the comfort and joy of San Juan Beach we decided we had to do some exploring. So we got on the tram heading for the Old Town and the harbour. Such a lovely way to travel and to see more of the city and all for €1.45 for what was about a 35-minute journey. We passed a lot of concrete along the way and emerged into a buzzing metropolis. The main road down from the station, Ramble de Mendoza Lunez, leads down to the beach. If you’re looking for shopping opportunities take a slow walk down as there’s plenty on offer here. 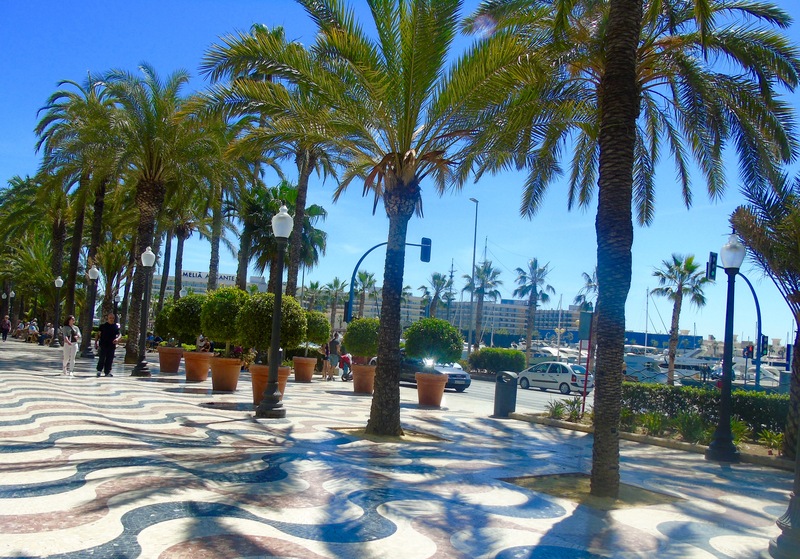 As you start getting close to the water there’s another palm-lined promenade to stroll along. There’s a sparkling harbour filled with stylish boats – and even a pirate ship. After some waterside strolling we headed into the Old Town for lunch. With the feel of ancient Spain and beautiful old buildings to view, there were also plenty of restaurant choices to explore. 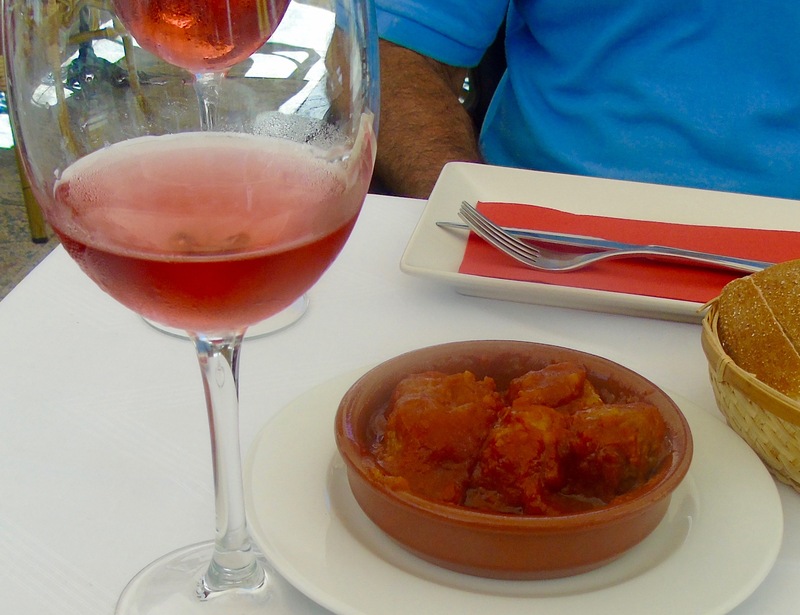 Greetings of hola, buenos días lead us to a table at La Taberna San Pascual where we tucked into delightful albondigas (meatballs) and croquettes, accompanied by some delicious Spanish rose. 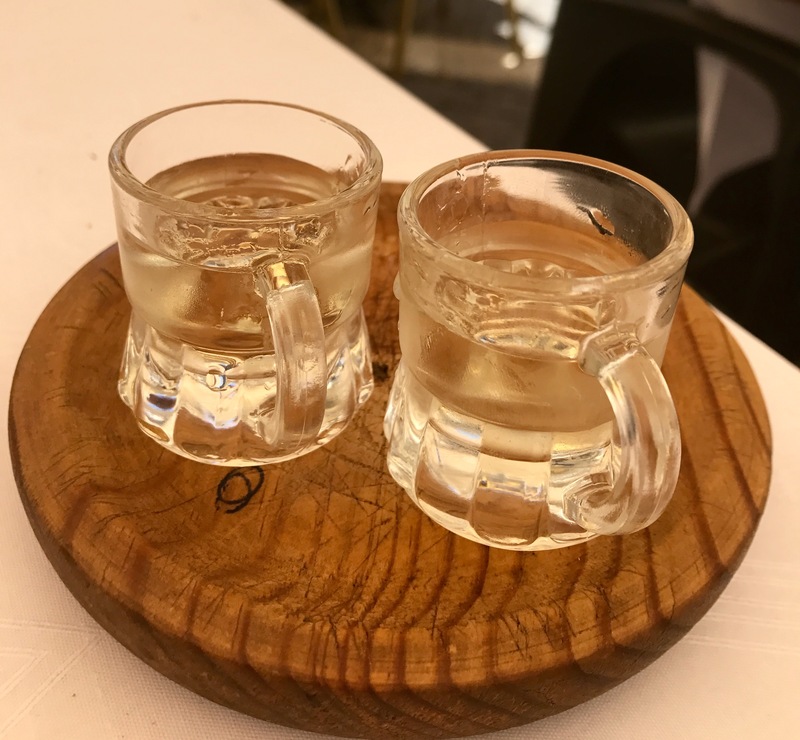 We finished off lunch with a charming mini-mug of the local liquor – all complimentary of course. How I love complimentary local liquor. So that was Alicante, a place can see myself visiting again and again and one I’d definitely recommend for a Spanish fix. Just make sure you see past the concrete. We stayed at the Holiday Inn San Juan which was a short walk from the promenade and the beach. Though basic, the hotel was comfortable and welcoming and has a lovely pool area for lazy afternoons. I’d never heard of Alicante, now I’m dying to go. All the food looks amazing! I’ve been hearing a lot about Alicante lately. After seeing your delicious photos, I want to plan a trip sooner than later. Looks fabulous! I haven’t been to Alicante yet! this post seriously made me want to go. Have you? I was surprised as although the architecture leaves something to be desired, everything else about it was lovely. And the area we stayed in was all very Spanish which I love. I really loved it, as I said you will need to see past the concrete! We really loved it, and would go back tomorrow. There are so many more restaurants to try! And bars of course! I’m so pleased my post sounded so tempting! I did really love it, and it is so Spanish which too many seaside towns in Spain aren’t anymore. If you do go let me know and I can tell you more! 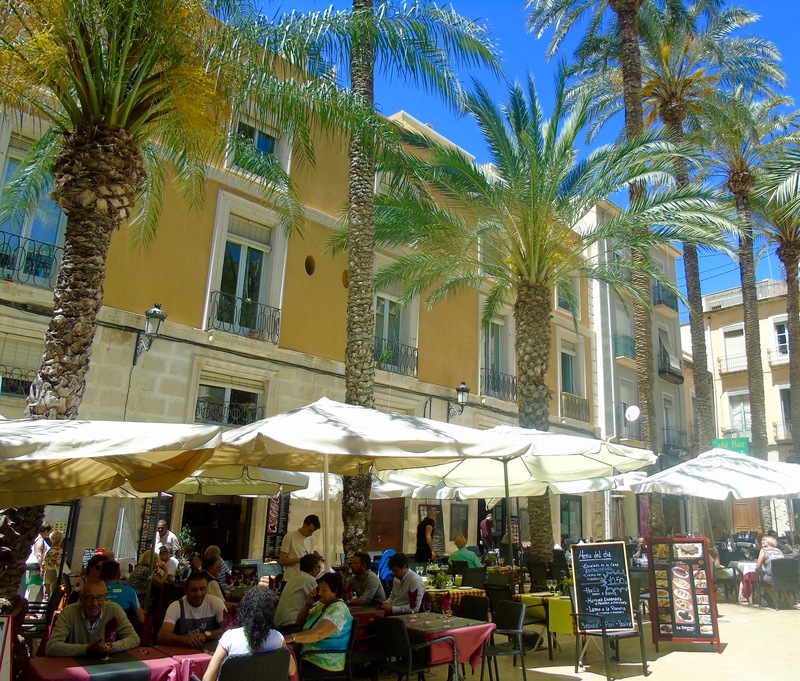 I have heard a lot about Alicante but have not read a blog about it. This place really looks amazing and the food sounds delicious. I hope I can go there one day. Thanks for sharing. There’s a lot of lovely things to see and do Thelma, hopefully you will be able to visit one day.